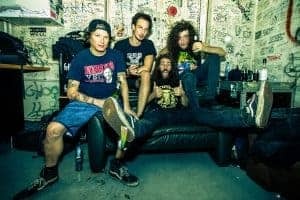 (TRASH/CROSSOVER) The alpine 4-piece mows everything down: Crossover-Thrash like the good old days, with a big evil grin from ear to ear and a skate, party drenched humour (“Life’s Too Short For Longboards!”, “Disco Demolition”). The singer may remind me of Mike Muir from Suicidal Tendencies sometimes, yet Insanity Alert sounds way more metallic and are definitely faster! Brutal riffing, gang-shouts, effective moshparts, everything presented in a tight old-school sound which barely keeps me from opening a beer. D.R.I., Municipal Waste, early Suicidal Tendencies, S.O.D., early Anthrax, Nuclear Assault ,Dr. Living Dead! – that’s where Insanity Alert gets the toxicated inspiration. Thrash Harder! It’s all about having a good time and a massive moshpit: Metal Punk at its best, that’s what these dudes from Innsbruck celebrate – and everyone wants to join the festivities.